Western blot analysis of extracts from HeLa cells, transfected with 100 nM SignalSilence® Control siRNA (Unconjugated) #6568 (-) or SignalSilence® CTCF siRNA I (+), using CTCF (D31H2) XP® Rabbit mAb #3418 (upper) or α-Tubulin (11H10) Rabbit mAb #2125 (lower). 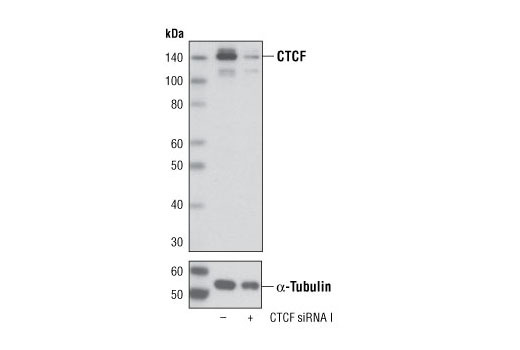 The CTCF (D31H2) XP® Rabbit mAb confirms silencing of CTCF expression, while the α-Tubulin (11H10) Rabbit mAb is used as a loading control. CST recommends transfection with 100 nM CTCF siRNA I 48 to 72 hours prior to cell lysis. For transfection procedure, follow protocol provided by the transfection reagent manufacturer. Please feel free to contact CST with any questions on use. CCCTC-binding factor (CTCF) and its paralog, the Brother of the Regulator of Imprinted Sites (BORIS), are highly conserved transcription factors that regulate transcriptional activation and repression, insulator function, and imprinting control regions (ICRs) (1-4). Although they have divergent amino and carboxy termini, both proteins contain 11 conserved zinc finger domains that work in combination to bind the same DNA elements (1). CTCF is ubiquitously expressed and contributes to transcriptional regulation of cell-growth regulated genes, including c-myc, p19/ARF, p16/INK4A, BRCA1, p53, p27, E2F1, and TERT (1). CTCF also binds to and is required for the enhancer-blocking activity of all known insulator elements and ICRs, including the H19/IgF2, Prader-Willi/Angelman syndrome, and Inactive X-Specific Transcript (XIST) anti-sense loci (5-7). CTCF DNA-binding is sensitive to DNA methylation, a mark that determines selection of the imprinted allele (maternal vs. paternal) (1). The various functions of CTCF are regulated by at least two different post-translational modifications. Poly(ADP-ribosyl)ation of CTCF is required for insulator function (8). Phosphorylation of Ser612 by protein kinase CK2 facilitates a switch of CTCF from a transcriptional repressor to an activator at the c-myc promoter (9). CTCF mutations or deletions have been found in many breast, prostate, and Wilms tumors (10,11). Expression of BORIS is restricted to spermatocytes and is mutually exclusive of CTCF (3). In cells expressing BORIS, promoters of X-linked cancer-testis antigens like MAGE-1A are demethylated and activated, but methylated and inactive in CTCF-expressing somatic cells (12). Like other testis specific proteins, BORIS is abnormally expressed in different cancers, such as breast cancer, and has a greater affinity than CTCF for DNA binding sites, detracting from CTCF’s potential tumor suppressing activity (1,3,13,14). Klenova, E.M. et al. (2002) Semin Cancer Biol 12, 399-414. Klenova, E.M. et al. (1993) Mol Cell Biol 13, 7612-24. Loukinov, D.I. et al. (2002) Proc Natl Acad Sci USA 99, 6806-11. Mukhopadhyay, R. et al. (2004) Genome Res 14, 1594-602. Hark, A.T. et al. (2000) Nature 405, 486-9. Ohta, T. et al. (1999) Am J Hum Genet 64, 397-413. Chao, W. et al. (2002) Science 295, 345-7. Yu, W. et al. (2004) Nat Genet 36, 1105-10. El-Kady, A. and Klenova, E. (2005) FEBS Lett 579, 1424-34. Filippova, G.N. et al. (1998) Genes Chromosomes Cancer 22, 26-36. Filippova, G.N. et al. (2002) Cancer Res 62, 48-52. Vatolin, S. et al. (2005) Cancer Res 65, 7751-62. Hong, J.A. et al. (2005) Cancer Res 65, 7763-74. D'Arcy, V. et al. (2008) Br J Cancer 98, 571-9.